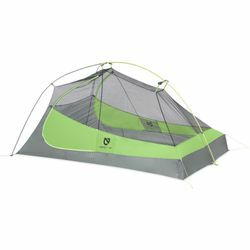 NEMO Hornet 2P Ultralight Backpacking Tent. For those looking for a ultralight shelter with greater volume, Hornet™ offers the ultimate in livability and comfort. Top shelf fabrics and a minimal pole structure shave every ounce possible, while our latest updates and new patent-pending Flybar™ volumizing clip add even more room without adding any weight. Large doors and vestibules provide ample gear coverage for each person.